First Line: When you marry a gay man, it shouldn't come as a surprise when he leaves you. 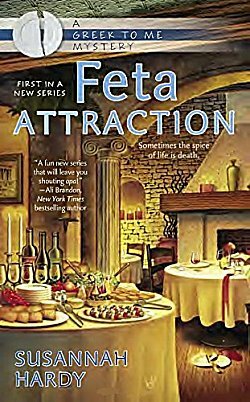 When her husband disappears and her main competitor is killed, restauranteur Georgie Nikolopatos finds herself trying to solve a murder. Last year I read Yarned and Dangerous by Sadie Hartwell. I enjoyed it so much that when I learned that she wrote this Greek to Me cozy series as Susannah Hardy, I knew I had to give it a try. Unfortunately this series and I are not meant to be. I did like the interesting local history that was used in Feta Attraction, and the old octagon-shaped house made a good restaurant. The setting I liked; it was the main character and the mystery that I had problems with. There's also a bit too much going on plotwise: missing husband, murdered man, hidden treasure, missing money, illegal contraband, weird noises, secret spaces, and a "ghostbusting" team that really wasn't necessary at all. No, Feta Attraction just was not my cup of tea, but your mileage could certainly vary! I think you bring up a really important point about cosy mysteries, Cathy. If you can't warm up to the main character, then it just isn't as good an experience. Sorry to hear that this one just didn't really do it for you. Yes, it's pretty much all about the main character, isn't it?